Happy Resurrection Sunday! We had a fun but busy Holy Week. 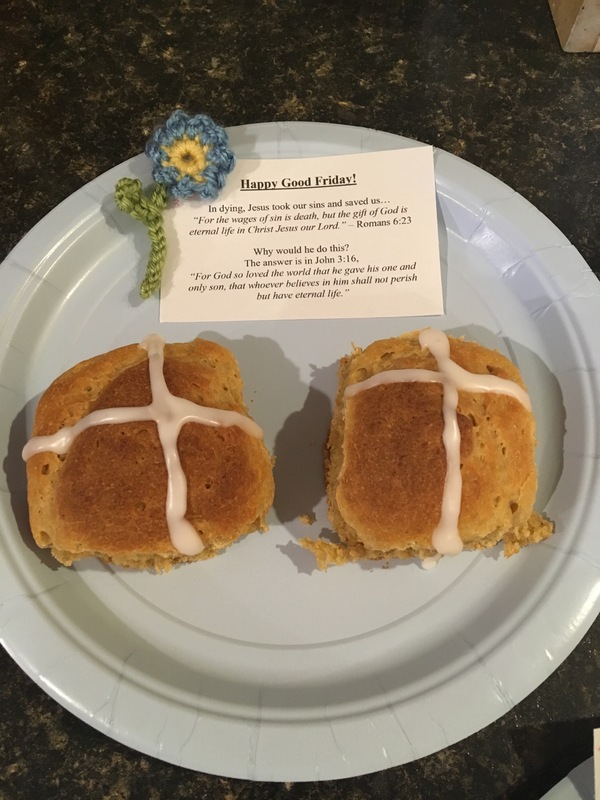 On Friday, the kids and I did our traditional hot cross bun baking and delivered them to friends and family that live in our area. It is always a fun way to spend our morning, and we love bringing joy and smiles to people (along with delicious treats). 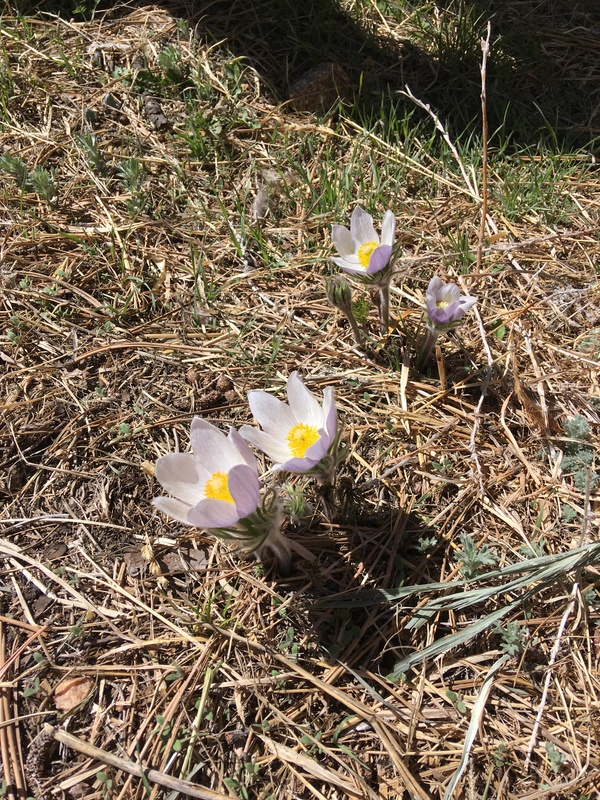 I love the wild pasque flowers we have growing in our area. When they pop their pretty purple heads up each spring it makes me smile. I don’t know about you, but our barn gets so messy over the winter that come spring I am very anxious to get it cleaned out. I think it is because of the cold weather – we don’t exactly want to spend extra time out there tidying and freezing while we work – it is more about get out there, quickly take care of the critters, and get back in by the fire to warm up. So things don’t get put away and the floor doesn’t get swept and it just builds up and gets cluttered and super dusty. So this last week we decided it was time to spring clean the barn. It took me and 3 of the kids about 2.5 hours to really get it done. But it felt oh-so-good when it was done. 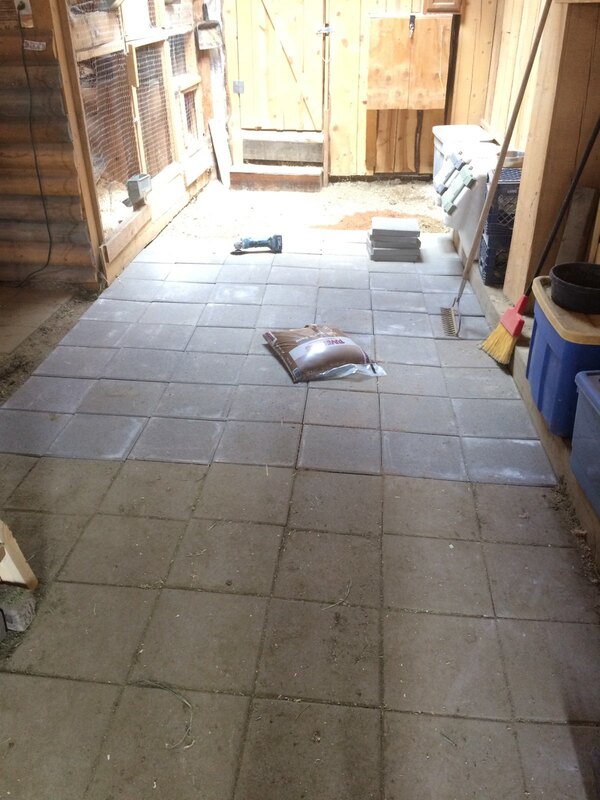 Then we laid cement pavers to finish the floor in the barn. A few years ago the barn flooded and the wood floor that was in there had to be torn out. We were able to put cement pavers down on half the floor but couldn’t afford to buy more at the time. Then time went by as it always does and it just was left half pavers half dirt for a couple of years. We finally got around to buying the rest of the pavers and laying them this week. It is so much nicer than the dirt and will help keep the dust down! You can see in the photo the line of old pavers vs the new ones. 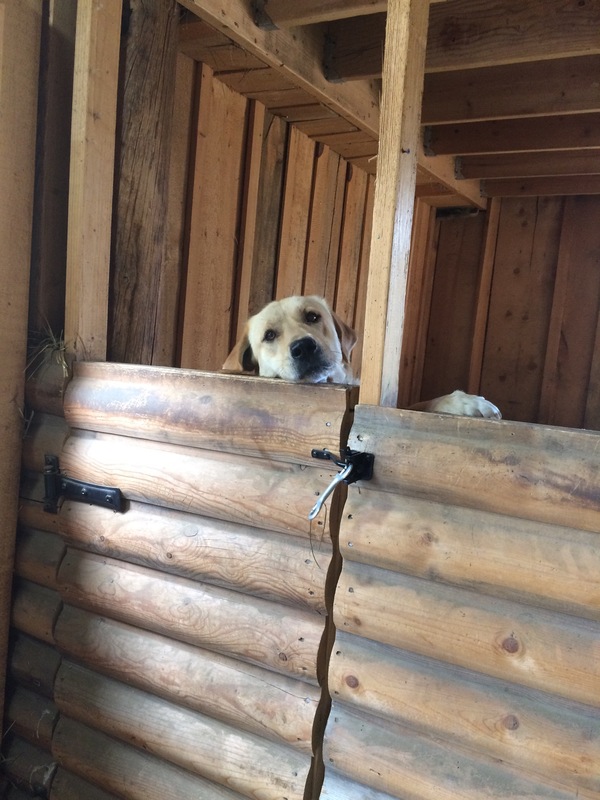 And while we worked this cutie pie kept peeking at us over the stall wall. 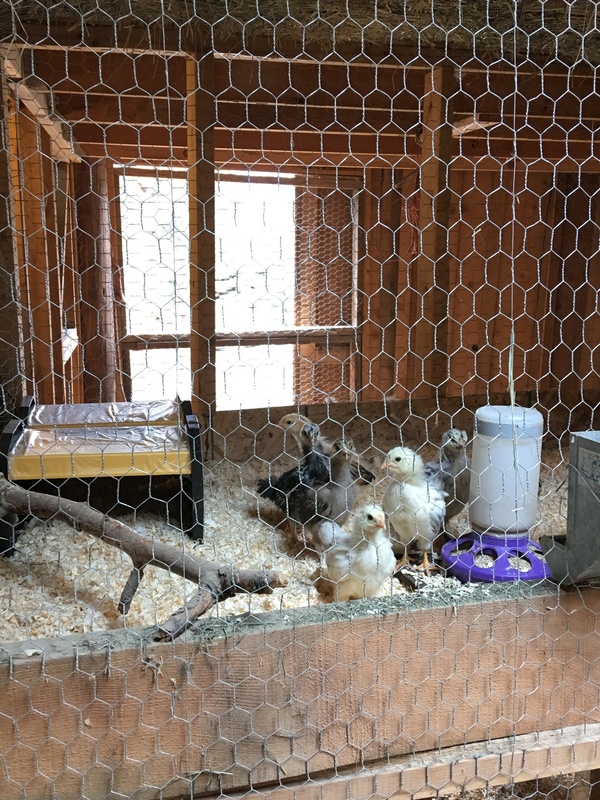 We now have chicks that are 8 weeks old, up in the barn. We are beginning to be able to tell some of the boys from the girls. 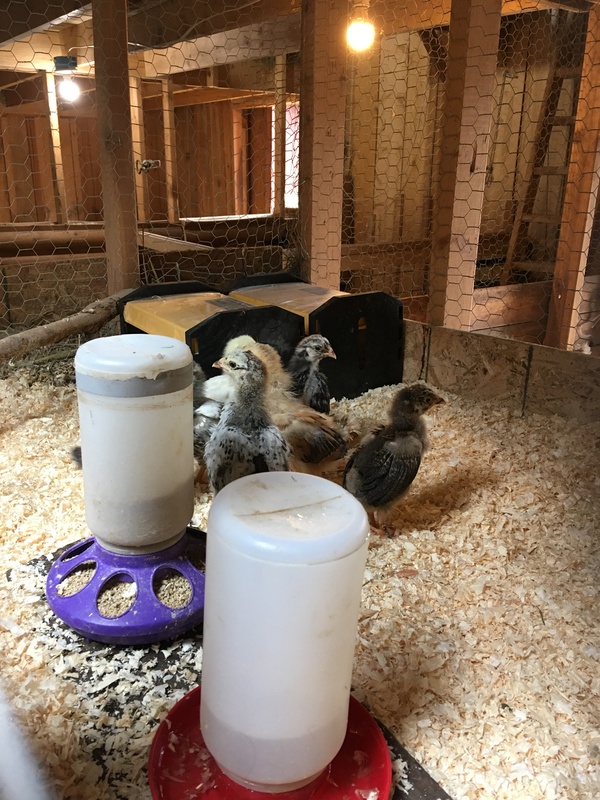 We also have 7 chicks that were just moved from the brooder bin up to the barn. They are about to be 4 weeks old. It was a little early to move them, but the bin was way overcrowded. We gave them two of the ecoglow 20s and are hoping they will handle the change well. 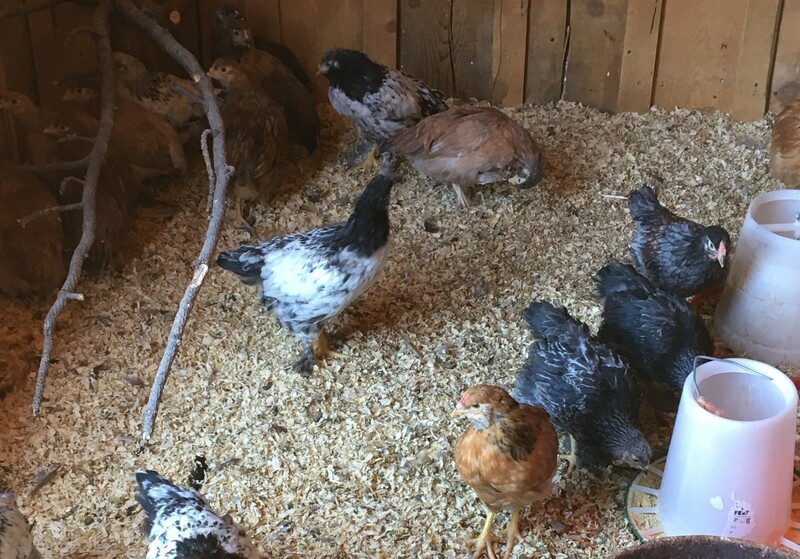 In this pic you can see the younger chicks in the forefront top pen, and the older chicks on the ground in the pen in the background. 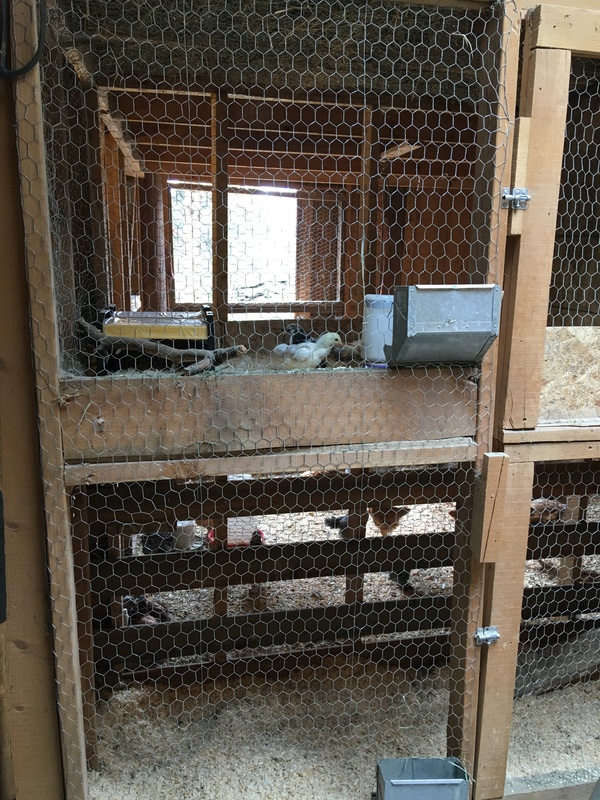 The foreground pen is cleaned and ready to move some other chickens into it in the next week or so as we organize and shift around the birds for spring. Even though that is plenty of chicks for the year, our most successful broody mama hen has decided she wants to set. 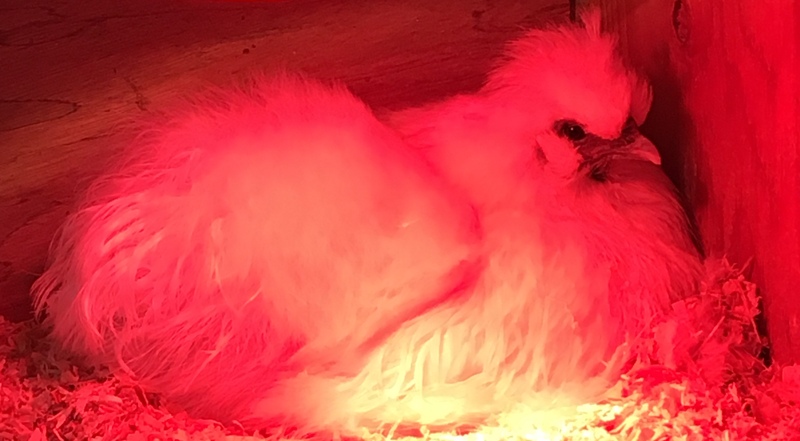 So we gave her 8 eggs and she is happily incubating them. 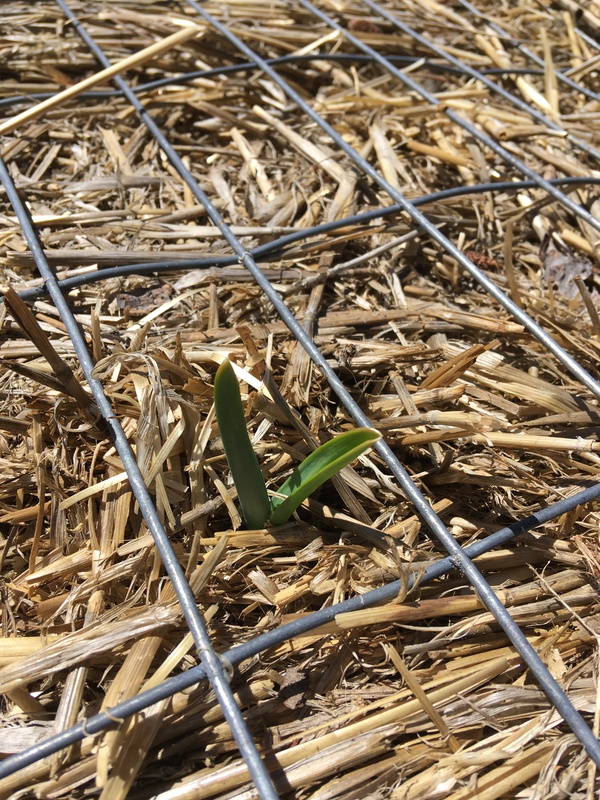 There are finally some green things poking out here are there around the farm! This is 4 weeks later than last year. So we are very happy to finally be seeing some tiny green. 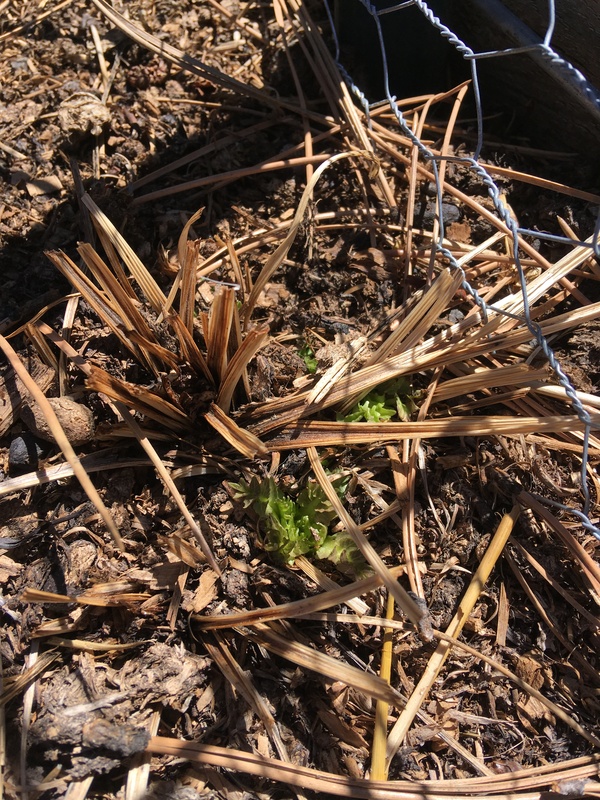 My Valerian is sprouting too, but it looks like there may be a problem. I have two plants. 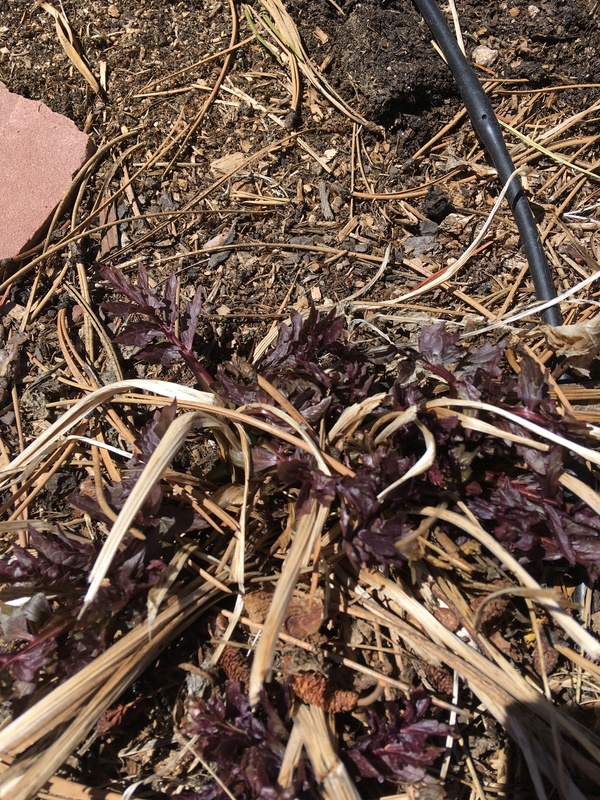 One is sprouting green leaves, and one is sprouting purple leaves. Last year was the first time I ever grew Valerian (these are 2nd year plants) so I don’t know much about them. But from what I can find the purple leaf one probably has a deficiency or a root disease. 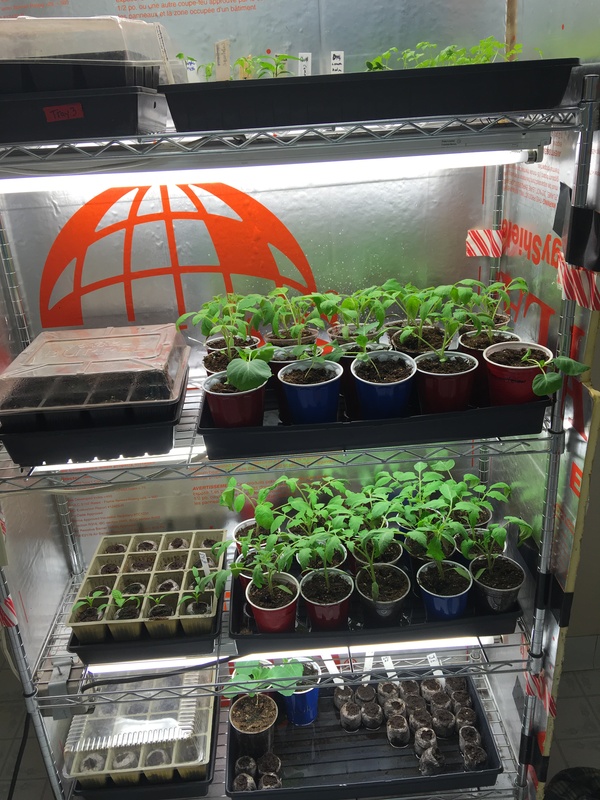 The seedlings in the basement under grow lights are doing well. 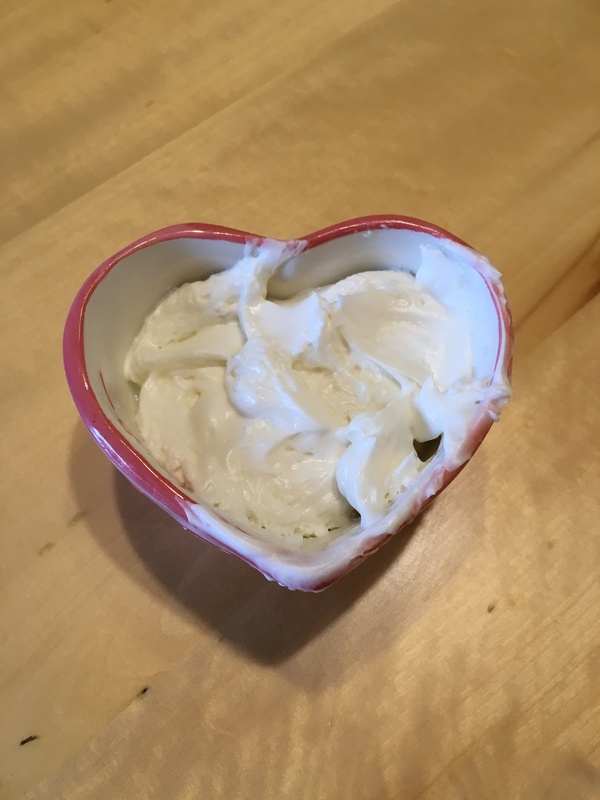 We made our first batch of goat’s milk butter for the year! It was yummy, and I always forget how white it is when we haven’t had it in awhile. Rose is giving us some confusing pregnancy symptoms. She is supposed to be 6 weeks out, but she is already showing symptoms that our other sheep don’t show until 2-3 weeks out. 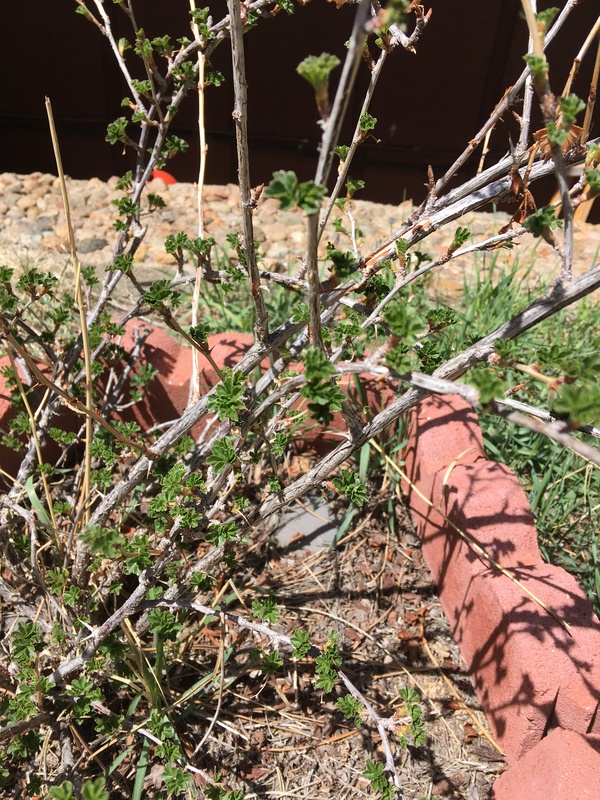 It is her first pregnancy, and often first-time mamas will show symptoms a bit earlier…but we have never had one show signs this much earlier. Could we be having lambs sooner than we thought? We are keeping a close eye on her and time will tell. With the nicer weather this week I have taken some time to sit and watch the barnyard. Such a peaceful relaxing way to spend some time. 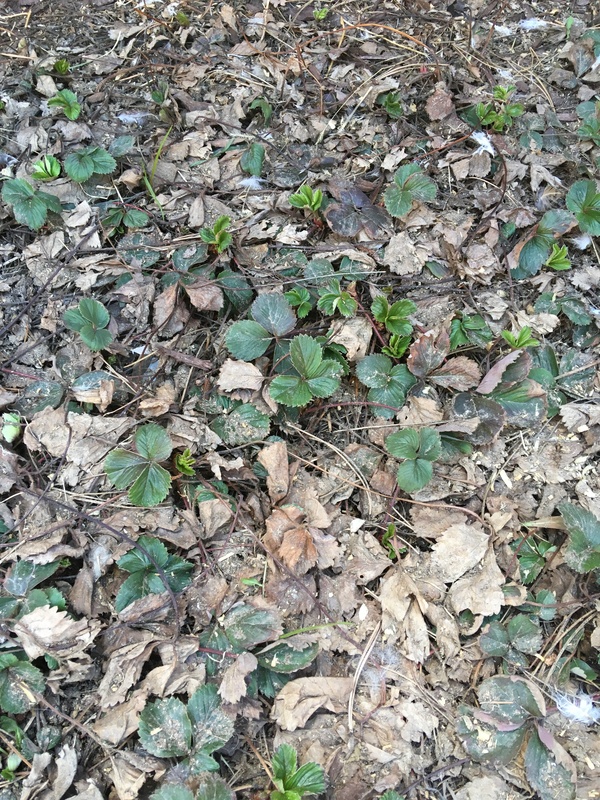 It is so nice to finally have some signs of spring popping up! Nutrition is such an important part of keeping livestock and is often not given the attention that it needs. Feeding ewes through pregnancy is especially important and can literally mean life or death of both the ewe and lamb(s) if it is not handled properly towards the end of pregnancy. The first part of pregnancy we feed our ewes the same as we always feed them. 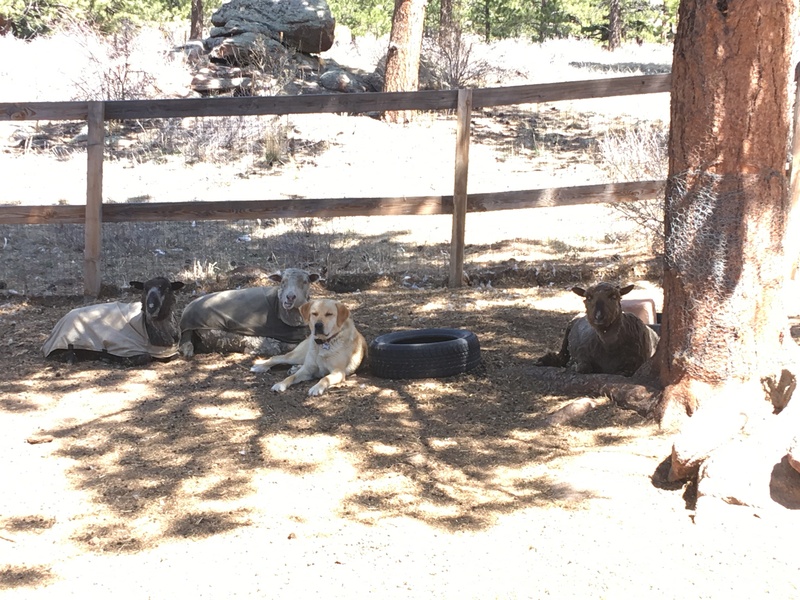 Each sheep gets approximately 3 lbs of good quality grass hay per day and no grain. 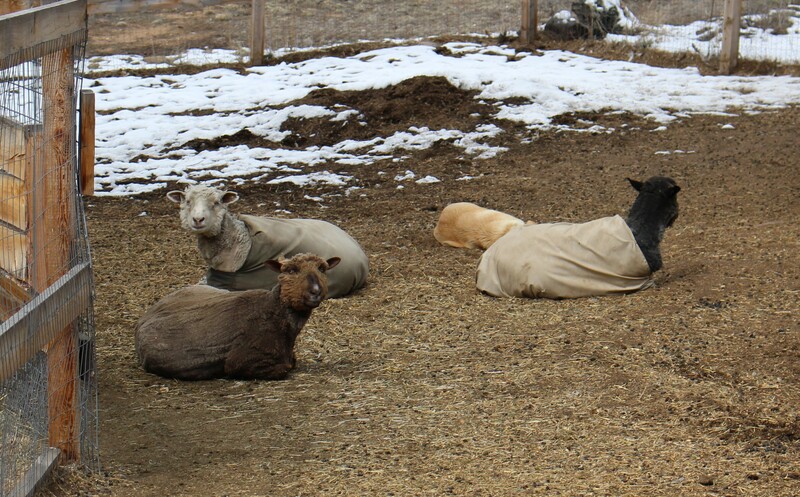 All sheep are different and this may or may not be a good amount for your particular sheep. Keeping a close eye on their body condition is important to making sure you are feeding right. 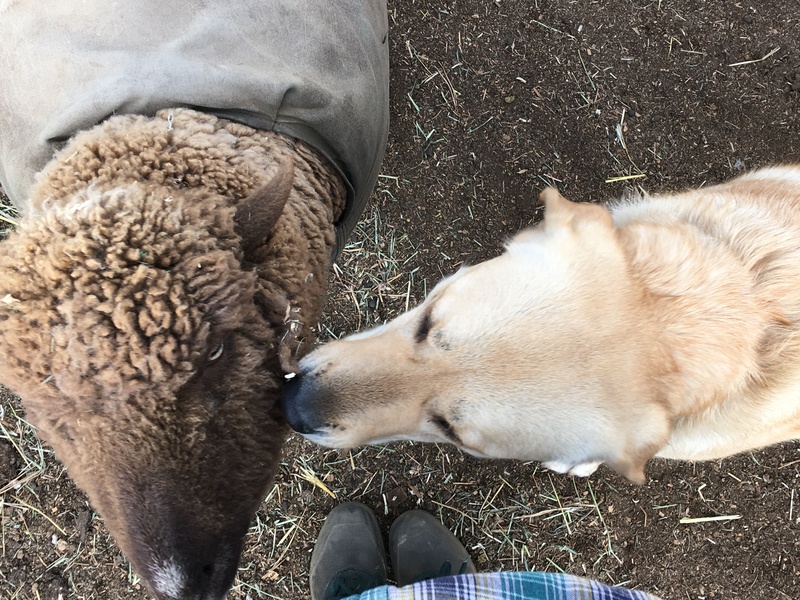 It can be harder with sheep due to all the wool on them, so it is important for you to learn how to feel them through the wool to estimate body condition. End of pregnancy ration changes should start 6-8 weeks before estimated lambing. If the sheep seem to be underweight you would want to start at the 8 week mark, if they are heavier then closer to the 6 week mark. Our ewes are now 6 weeks out from lambing time. We have shorn them, and now we are starting to switch their diet to the end-of-pregnancy rations. It is important to make changes gradually, and take into account your specific situation and ewes when making decisions. I will give you an overall general idea of end-of-pregnancy diet needs and then you need to tweak it for your situation. Our ewes are completely on cut hay, no pasture. Managing ewes on pasture is a whole different situation and thus this won’t apply to those ewes. At 6-8 weeks out from approximate lambing we shear the ewes. Do not shear ewes closer than 6 weeks from lambing as it can put the pregnancy at risk for miscarriage or lamb issues. Why is shearing before lambing the best time to shear a ewe? First, it prevents a break in the fleece. When a ewe gives birth and lactates it causes a weak spot in her fleece. If she were to give birth mid way through the growth of her fleece that means the weak spot will be in the middle of each strand of wool. That weak spot can cause the fiber to break during processing and potentially ruin the finished roving or yarn. It also decreases the value of a raw fleece that is for sale. So it is important to have that weak spot occur near the tip of the fiber. Secondly, ewes in full wool are hot. And anyone who has been pregnant knows that the end of pregnancy makes you very hot too, and labor/delivery is also hot. Shearing before lambing will help the ewe not be so overheated and will decrease the stress on her body. And in our area, where there can be snow on the ground during lambing, it helps keep the ewes from laying down in a snow drift to give birth, potentially killing the lamb. 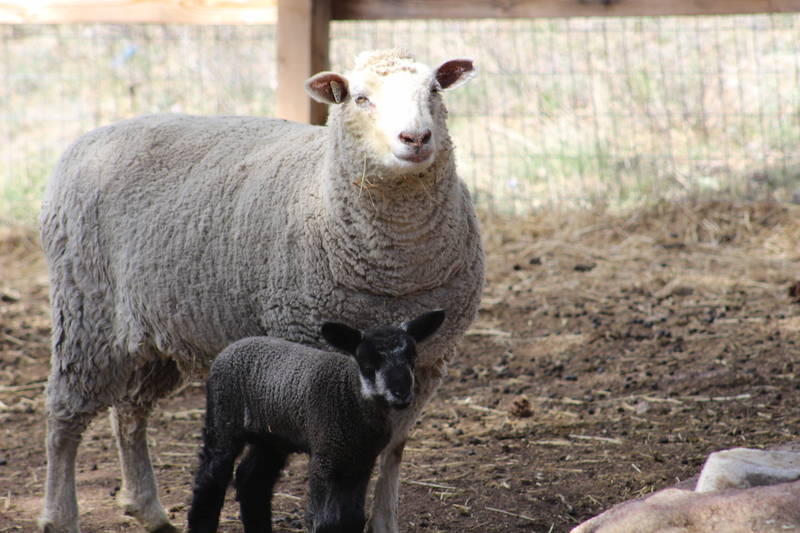 Third, having all that extra wool on can make cleaning up a ewe after birthing challenging, and it can make it hard for the lamb to find the udder and nurse well. They often can get confused and try to nurse on dangling wool. Plus, especially with sheep that have wool on their faces, it helps the mother bond with her lamb better when her face is clear of wool. The last benefit of shearing before lambing is that you can get a good look at the ewe’s body condition. Even when you are feeling her body through the wool it can be hard to really determine what her body condition is. Getting all that wool off gives you a chance to assess her better and feed accordingly. You do not want a ewe to be underweight nor overweight at delivery. Both can cause complications. But we tend to err on the side of a little overweight is better than even a little underweight. If a ewe is very overweight going into the end of pregnancy we would not increase her food as fast as the plan below. And if a ewe is very underweight we would increase her feed sooner and faster than the schedule below. Also, if a ewe is likely carrying twins or triplets she will need to be increased sooner or faster than the plan below. Properly assessing her body condition and making plans accordingly is the key to preventing pregnancy and birth complications. 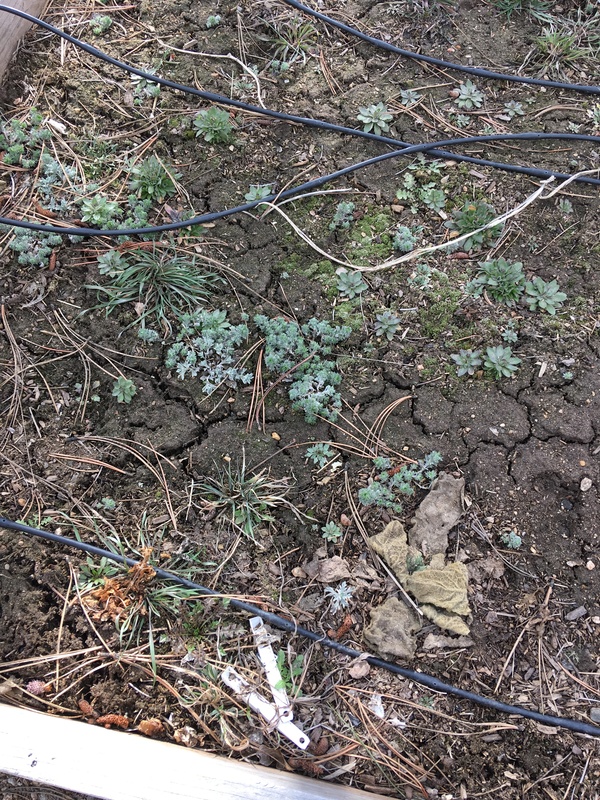 6 weeks out transition from 100% grass hay to 50% grass 50% alfalfa – make this transition over a 4-5 day period. Also begin giving each ewe a small amount of grain once a day (we just do a handful). 3 weeks out transition to 25% grass 75% alfalfa and increase the grain to 1/4 lb per day – make this transition over a 3-4 day period. 2 weeks out transition to 100% alfalfa (unless the ewe is overweight) and up to 1/2 lb grain per day – make this transition over a 3-4 day period. 1 week out through 2 weeks post lambing keep them on 100% alfalfa and anywhere from 1/2 lb-1 lb grain per ewe per day depending on body condition and number of lambs nursing. Ewes that are not fed properly at the end of pregnancy can get pregnancy toxemia. Therefore, it is very important to feed well and keep a close eye on ewes as they close in on delivery. If you suspect a ewe to be carrying twins or triplets and she is at all underweight then you should use ketosis strips to test her urine to be sure she is not slipping into ketosis and thus pregnancy toxemia. 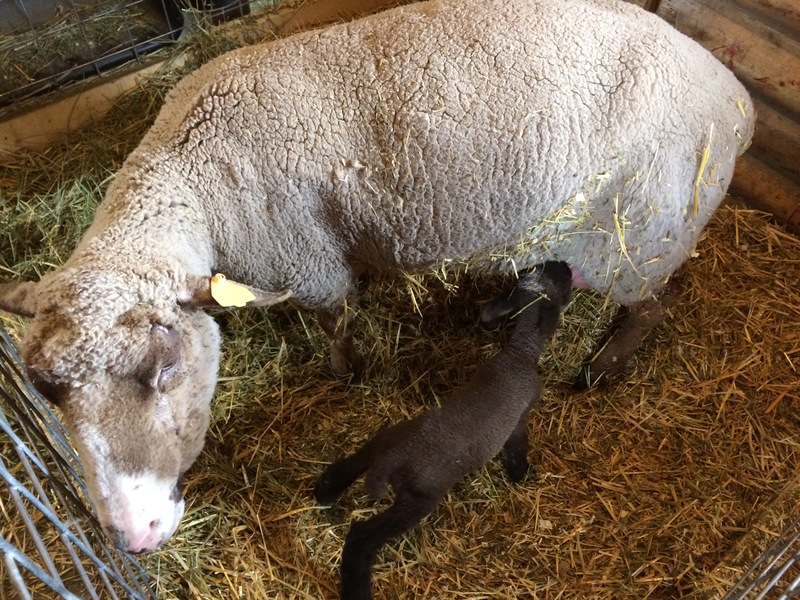 Catching pregnancy toxemia early is essential to save the ewe and lambs lives. But the best course of action is prevention through careful feeding and monitoring of your ewes during the last couple months of pregnancy. Rose was the last sheep that Mtn Man sheared this year. 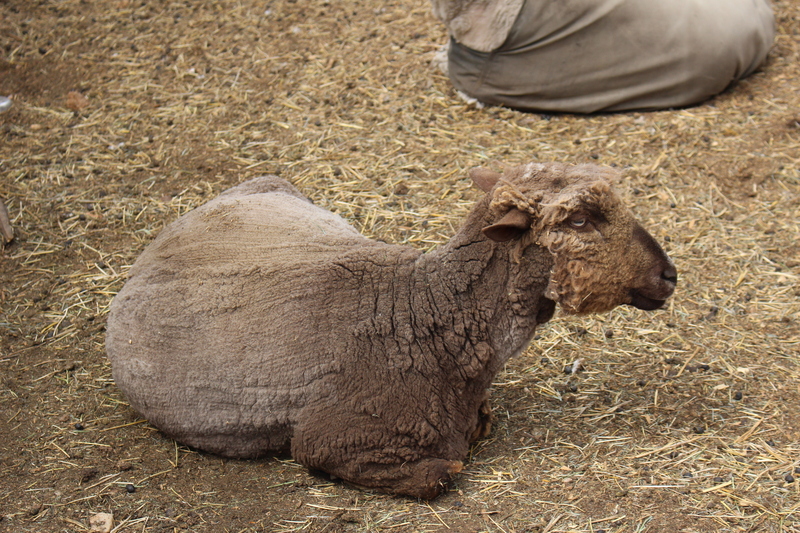 You can read about the 2019 shearing of Fergus and Fiona by clicking on their names. 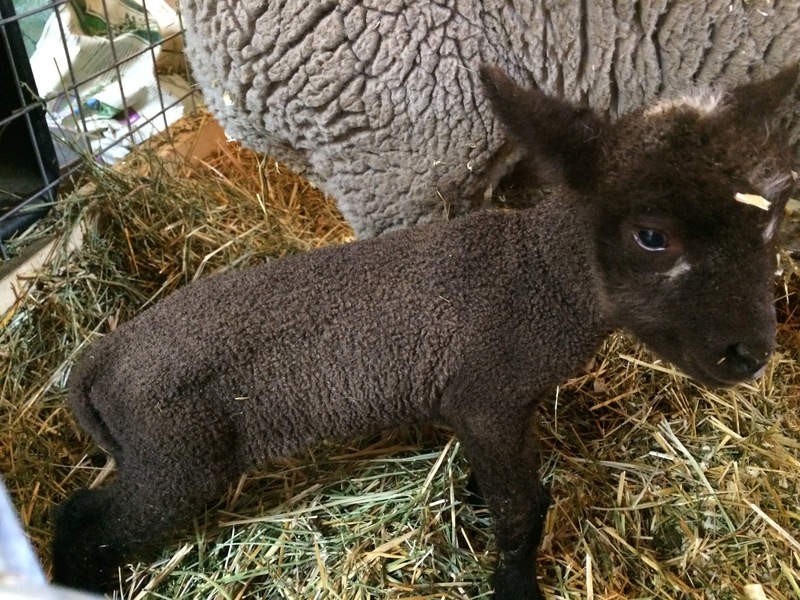 Rose is moorit colored CVM ewe. Moorit is a reddish brown color, and can have some tones of grey as well. It is a recessive color and lightens with age. So a moorit sheep is the darkest it will ever be at birth. 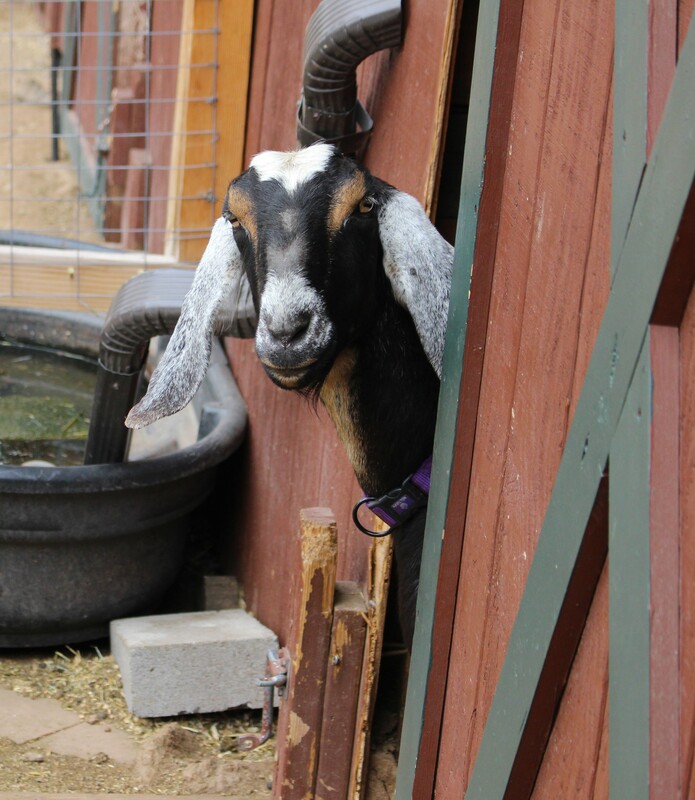 Rose was born here at WCF and she was so dark at birth that in the dim barn I at first thought she was black. It wasn’t until the sunlight came into the barn that we saw she was a moorit. You can see that her mom, who was 7 when Rose was born, is what moorit looks like when it fades out. Rose is now a 2-year-old, so her fleece is fading in color a lot from birth, but it is still much darker than her mother’s was. Because she is a purebred CVM she has a fine, short wool fleece. The shearing went well and she was not too heavy in vegetable matter. 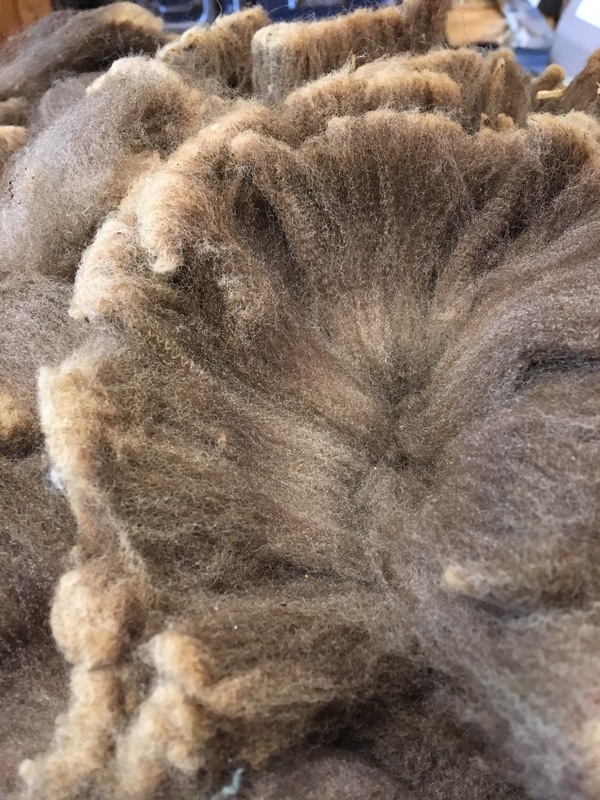 However, the short length of her fleece made skirting take more time because we needed to separate out the fleece that could be machine-spun in the mill, and the part that would need to be hand spun because it was too short for mill spinning. 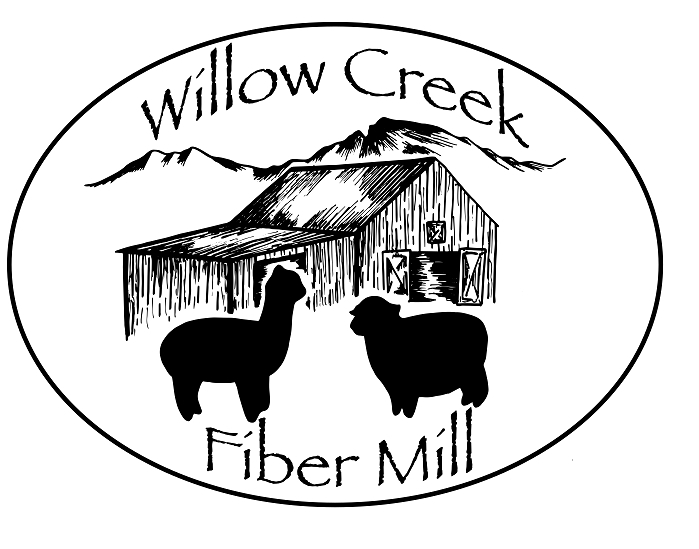 The milling equipment is long-draw, so it can’t handle fleece shorter than 3.5 inches staple length. Her fleece is a very fine, short, fleece with small amounts of crimp and medium amounts of grease. 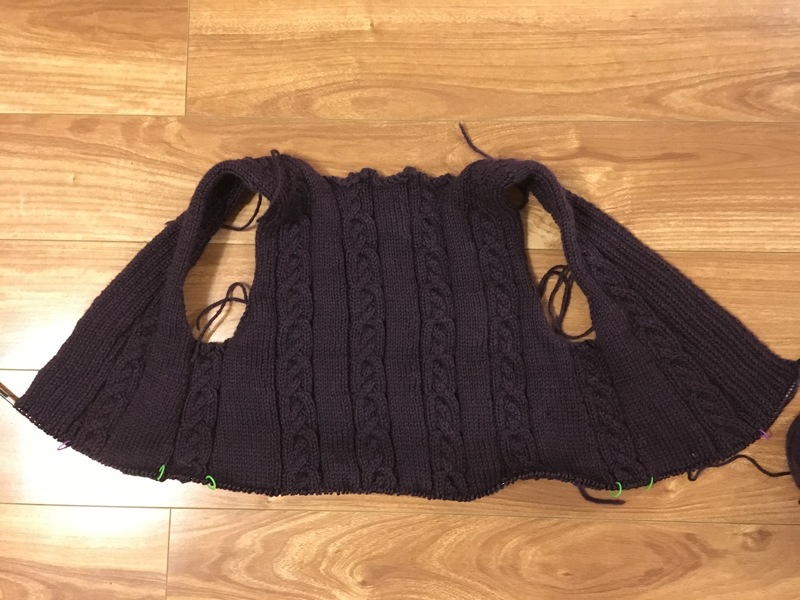 It does not have sheen like Fiona and Fergus do, but the fibers are far finer than either of theirs, making it super duper soft. The raw, skirted fleece weighed 3.6 lbs. We have not finished processing Rose’s 2018 fleece yet, so I have no yarn or projects to show you from her yet. It also means we don’t really have a plan yet for what we want to do with it this year. 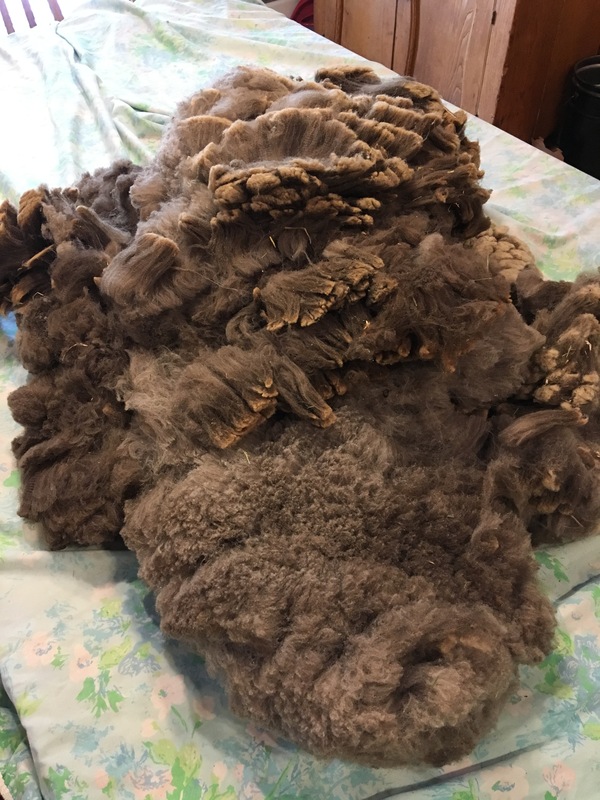 So when Mtn Man finishes up spinning her 2018 fleece we will decide how to proceed with this year’s fleece. Spring is such a full time on the farm. 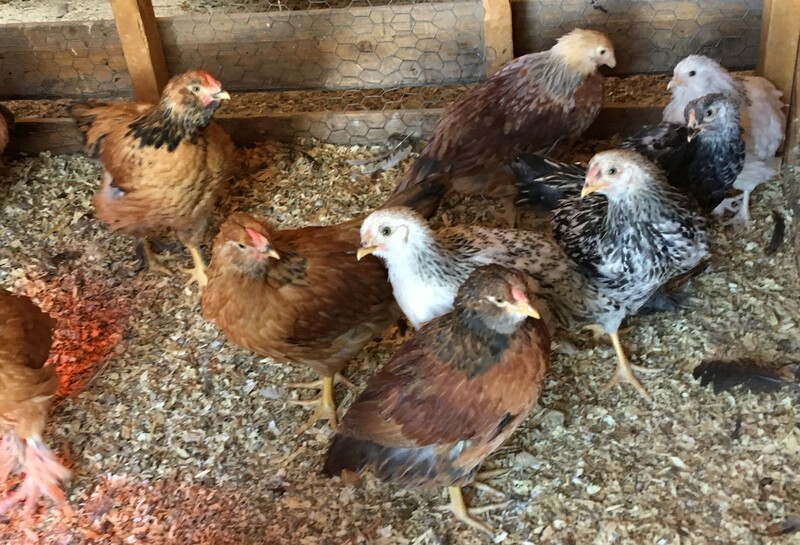 It is the season for hatching, brooding, seed starting, garden prep, shearing, lambing, milking, kidding, vaccinating, de-worming, and spring cleaning. It is a time that to me feels invigorating and productive. I am ready to shake off the sleepiness of a long dark winter and get out in the sun and fresh air and work hard. Our bodies are already in the spring sore phase as we have been out working on the garden and shearing. But it is a good feeling of sore. A strengthening of our muscles for the upcoming summer and fall seasons, which are very physically taxing seasons. Spring also means crazy weather. We have some days that are sunny and 60F, and then the next day we will have a foot of heavy, wet snow and be in the teens at night. We finished shearing and preparing the fleece for processing. 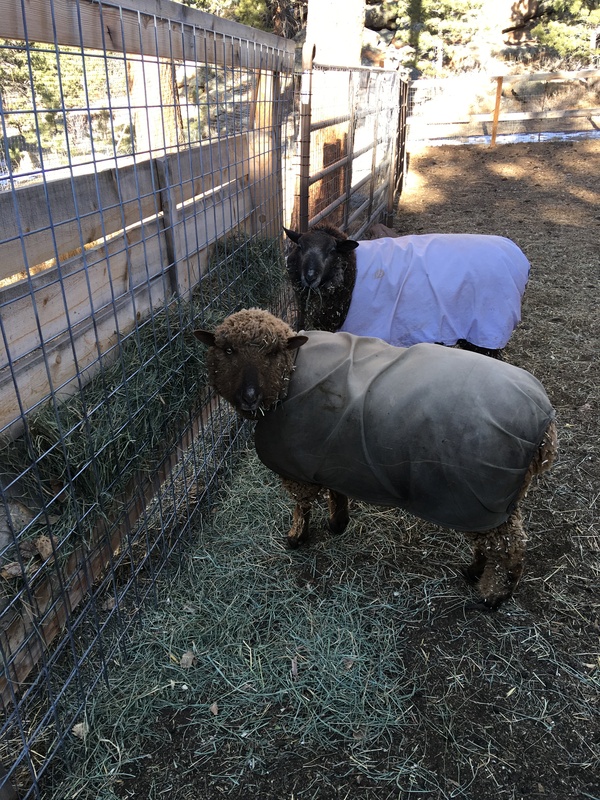 We have re-jacketed Fergus and Fiona, but haven’t gotten to Rose quite yet. We will remove the ewes jackets before lambing. We don’t want the jackets in the way of the lambs nursing and such. During shearing it was very clear that the girls are indeed pregnant. 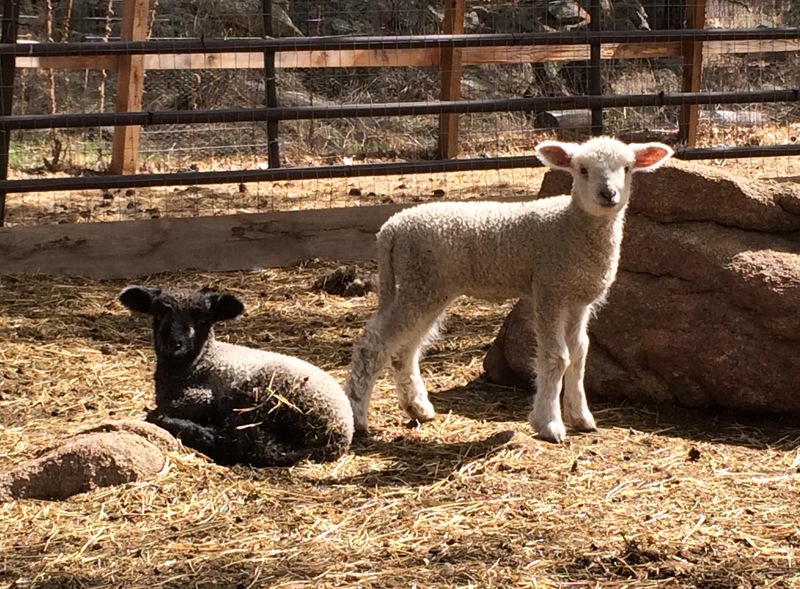 We are looking forward to the arrival of adorable lambs at the end of May. Meanwhile, it is time to switch their feeding program to help their bodies during the end of pregnancy, and to vaccinate them. Pansy has continued to settle in with the farm. Her milk production has stabilized as high as I think it will get for us this year. The stress of the move definitely decreased it. But we are happy to have some fresh goats’ milk at our farm again. 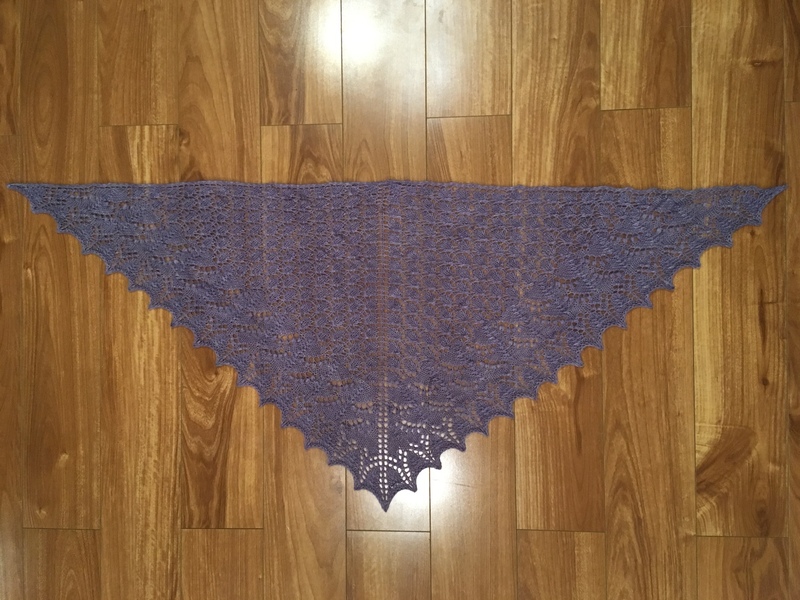 I finished my lace shawl! 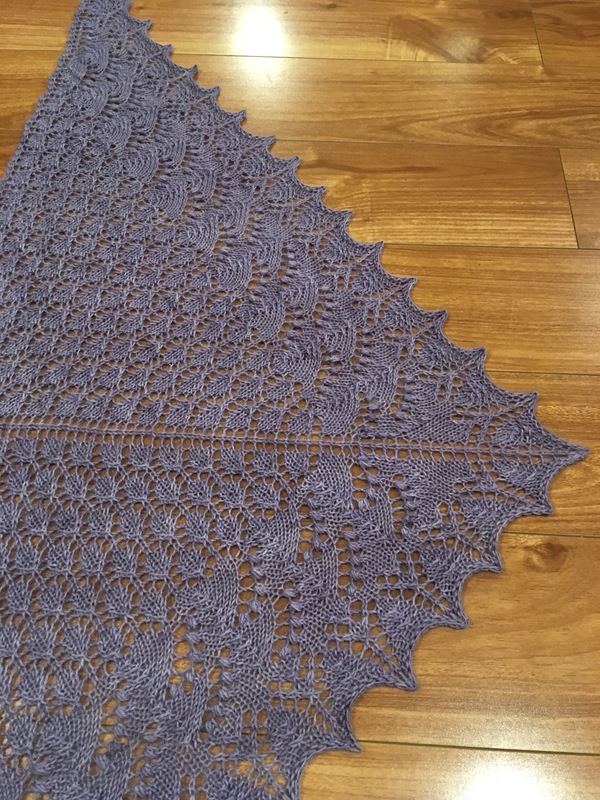 It is very exciting because this is my first lace project, and because it has been sitting on the needles for a year now constantly being put off for more imminent projects. The yarn is oh-so-soft and lovely. Little Miss and Sunshine are constantly making as many projects as I do, but I don’t often get around to photographing them and putting them on the blog. I am trying to change that and include more of their beautiful work too. 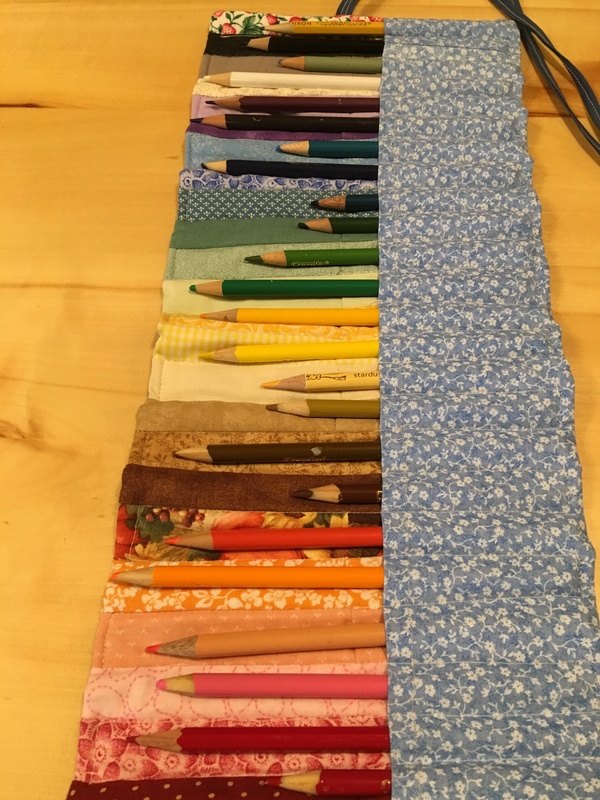 Little Miss loves to draw and color, so this week she made herself this cute roll-up case to hold her colored pencils. 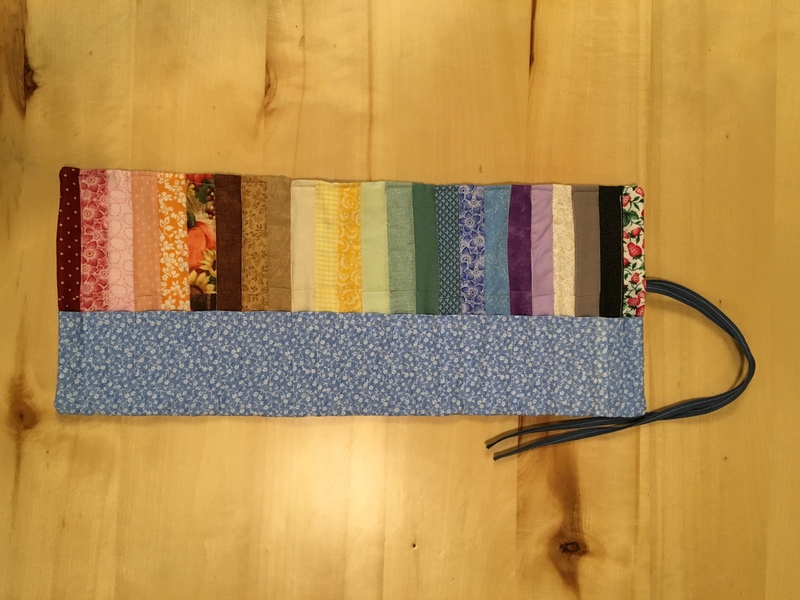 Sunshine is really enjoying quilting more and more these days. 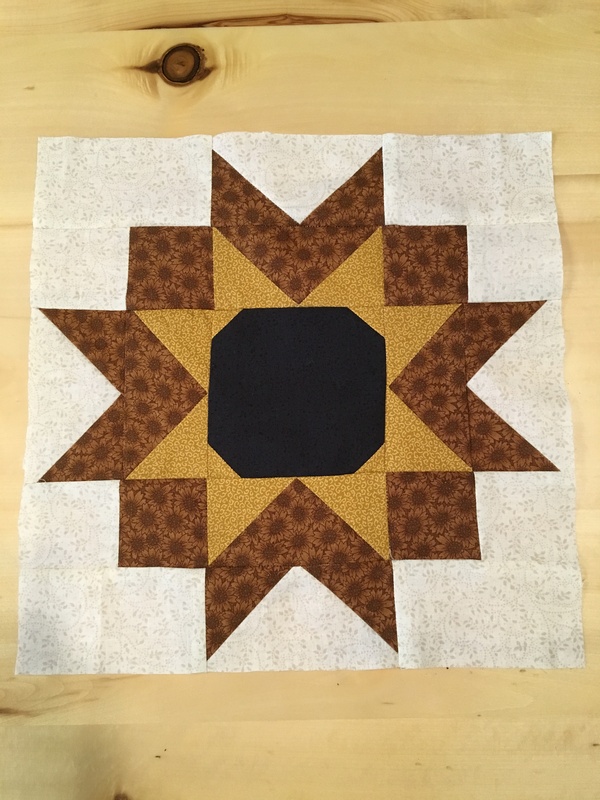 Right now she is working on a table runner that has sunflowers on it (her favorite flower). 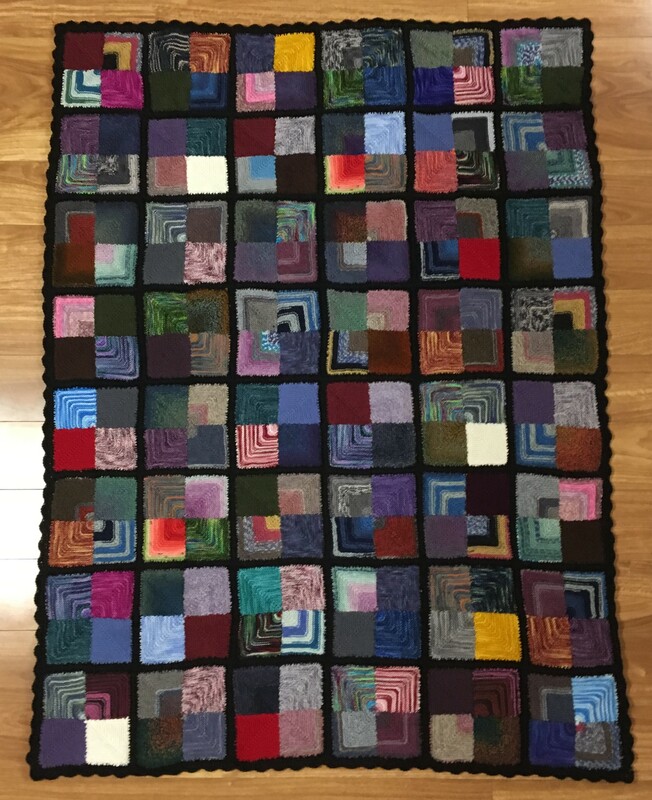 She has one of the squares completed so far. Spring has been slow coming to us. It has been colder overall than usual, though we have had some warmer days here and there. 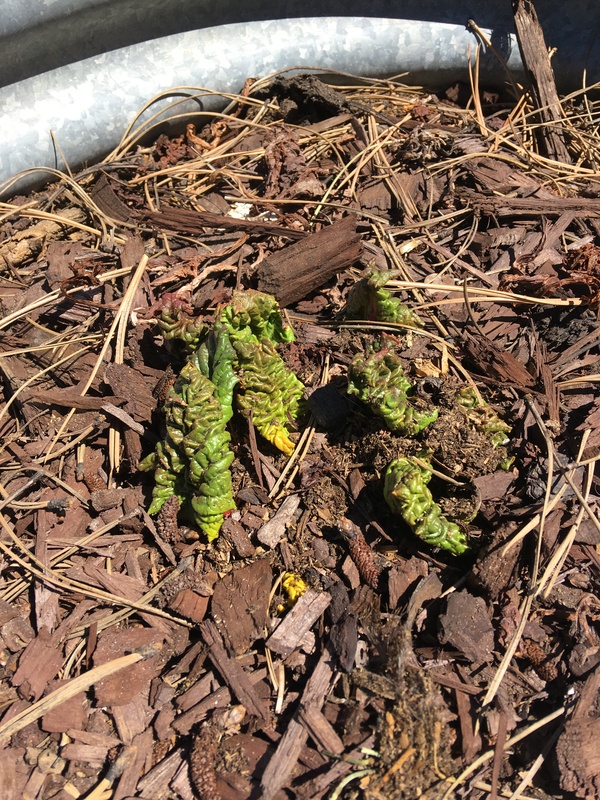 The perennial plants haven’t started poking green out yet, and last year they were poking out the second week of March. So it has been slow. But we are preparing so that when it finally arrives we will be ready. Despite the slow-to-come spring, the bears are awake and hungry. They have been causing us sleepless nights because they keep trying to get into the dumpster and that causes Anya to bark (good dog!) which wakes us up and Mtn Man goes out and chases them off. Thankfully they are just trying at the dumpster, not at the barn, or cars, or house, like they are doing in other places in our area. We are so grateful to have Anya in the barn to keep them away from it and to alert us when they are on the property causing mischief. And thankfully the replacement bear-proof dumpster we got a few weeks ago after a bear broke the last bear-proof dumpster is holding up against all their attempts. 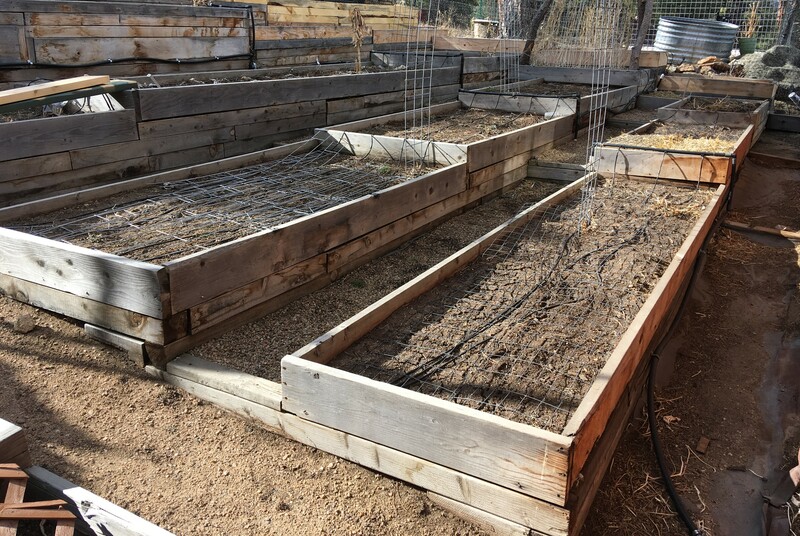 Most of the ground in the main veggie garden is thawed, so we spent Saturday working on preparing it for the upcoming garden season. We did not do a good job of cleaning it up last fall. Sometimes we do a really great job, other times…notsomuch. This was a notsomuch year. 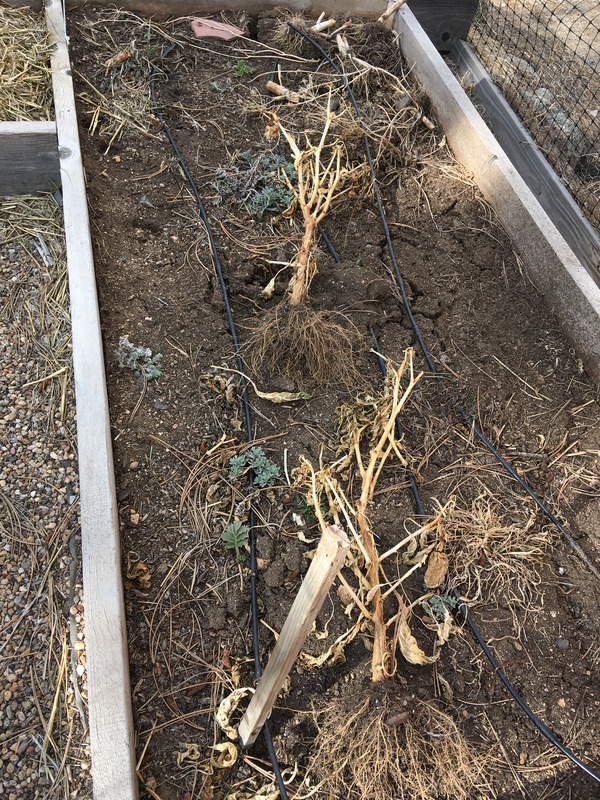 So there were a lot of leftover stalks and stems from last year, some weeds and moss that had grown during the fall, plus hard-packed, settled, and cracking soil, and the bean trellis needed to come down. So we got all of that cleaned out. Then we built up the newest deeper section. 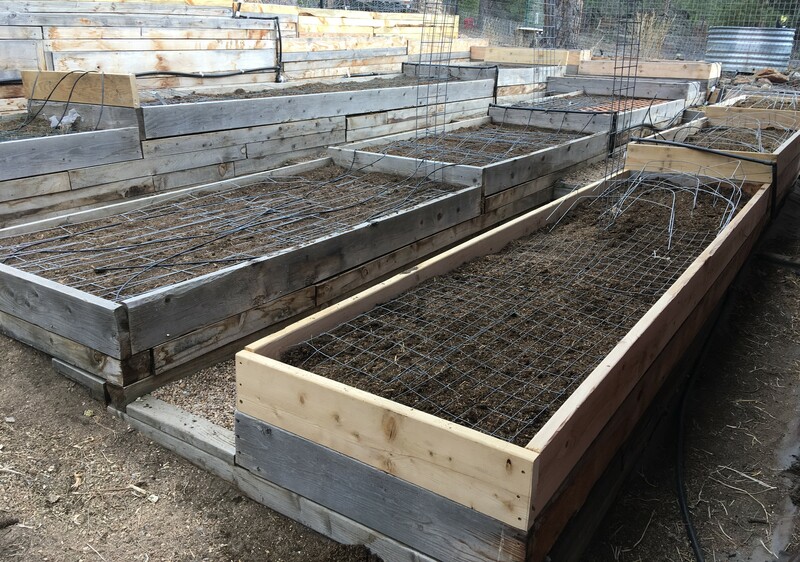 Each year we are building one section of the raised beds up 7 inches higher because we found deeper boxes grow much better. Here it is before and after the build up. Once we built it up we filled it with compost from the barnyard. 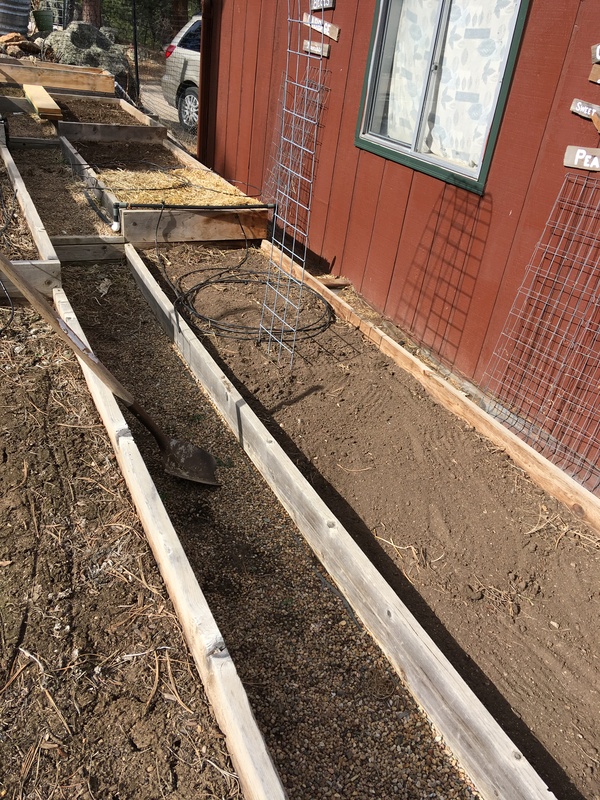 We then added compost to the rest of the garden as well and got everything raked and loosened up and then smoothed out and ready for planting. The metal stuff you are seeing in the boxes is our way of keeping the barn cats from using the fresh new garden soil as a litter box. 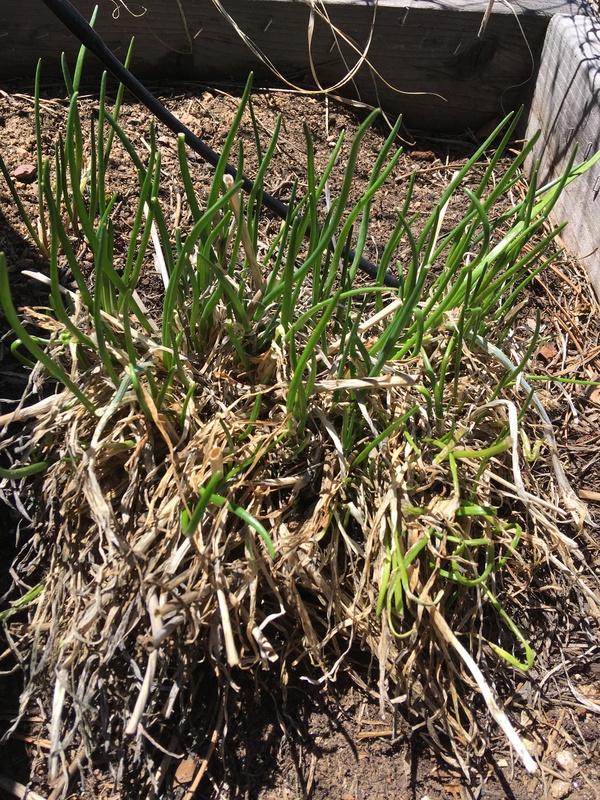 Once we plant and it is getting watered and such they leave it alone. But when it is just sitting there and no one is out there working in the garden they tend to sneak in there. 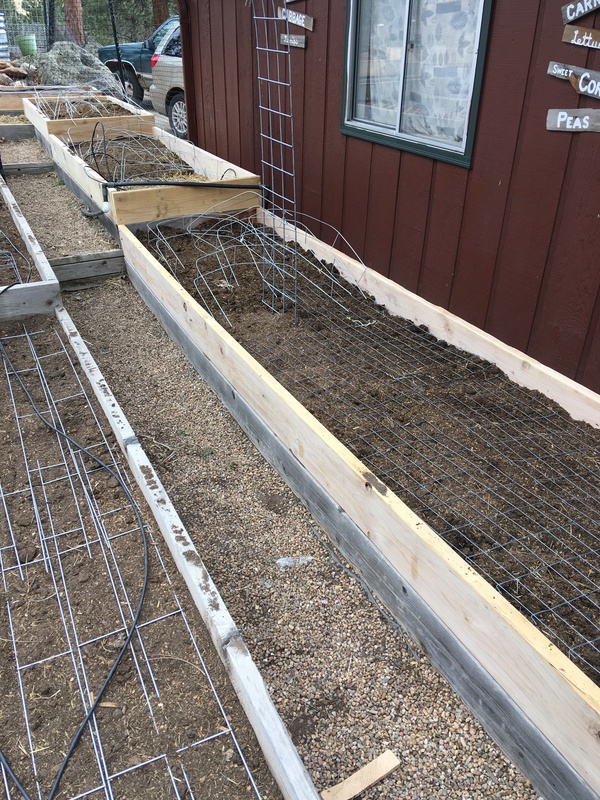 All that is left now is to do some maintenance on the water drip system and get it ready for the season, but we can’t do that until May because there are still going to be a lot of below-freezing nights. 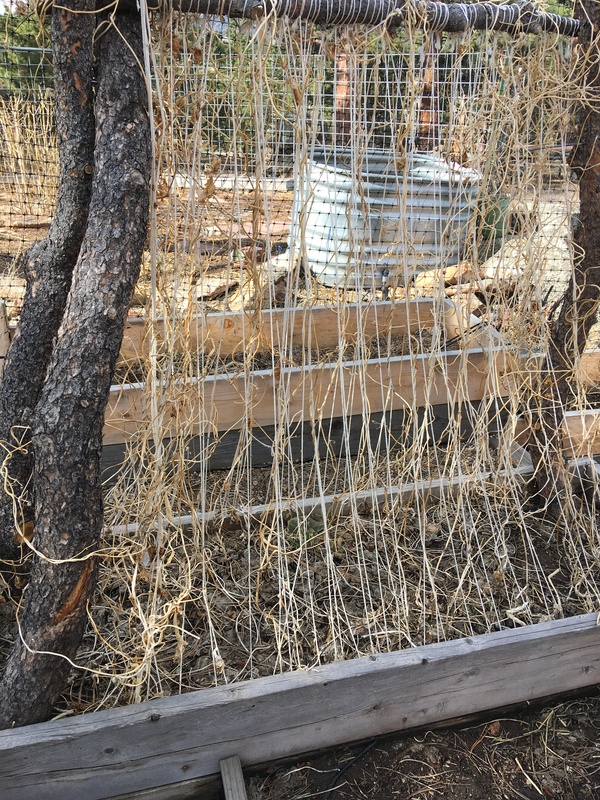 We also got the chicken wire around the base of the fence to the Apple Garden. 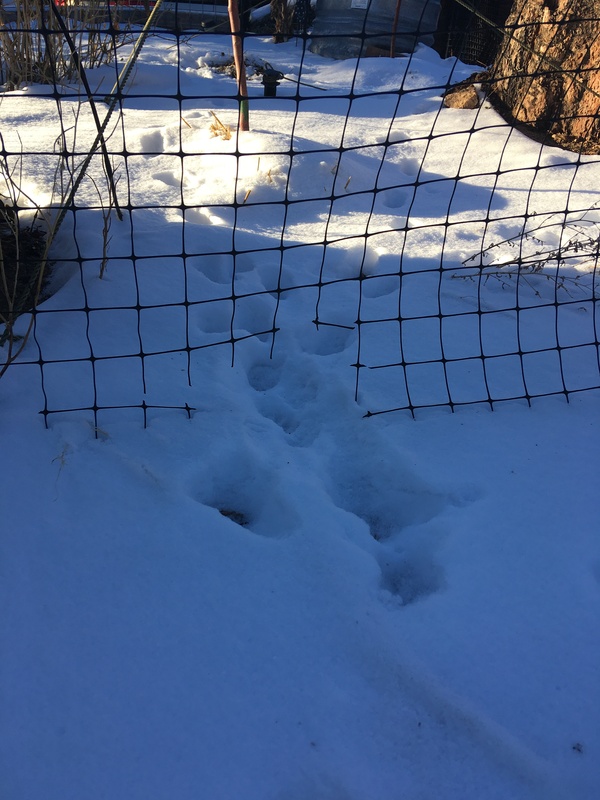 A bunny chewed a hole in the plastic mesh fence earlier this winter because we hadn’t gotten around to adding the wire yet. It is in place now and will protect the medicinal herbs from the rabbits. Pansy has settled in a lot more this week. She is eating really well now and her milk production is going back up because of it. She can often be seen laying with the flock of sheep chewing her cud, or running around with the dog (she is very dog-like in her personality and has bonded with Anya). She still roams around looking for her goat friends some each day. I am hopeful over time she will completely settle and wont do that anymore. As you saw in previous posts this week we have been shearing the sheep and skirting the fleece. The skirted fleece are headed for the wash and I am really excited to see what kind of yarn Mtn Man makes with them. We still need to shear Rose, and that will happen this week. The sheep that got shorn look very different now, they went from big puff balls to seemingly scrawny looking things comparatively. 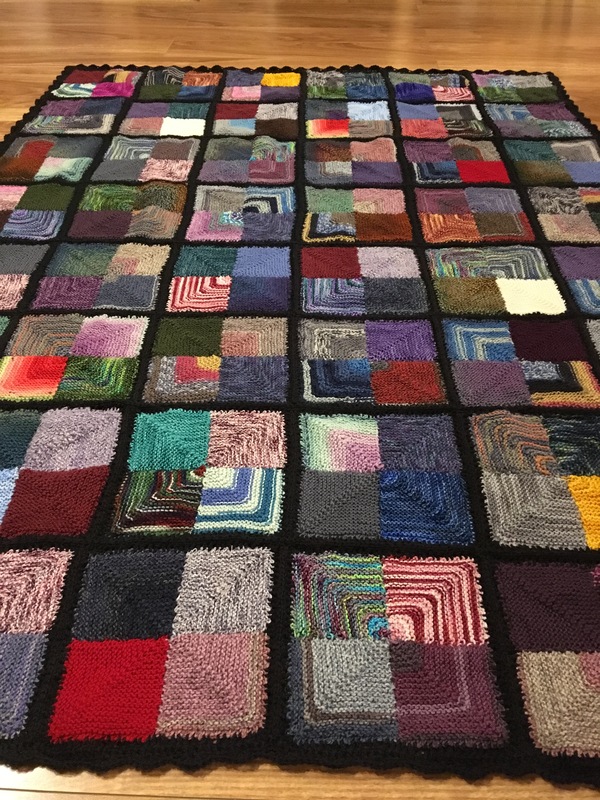 I finished the afghan I have been working on for almost a year now with sock yarn scraps! I am very happy with how it turned out and have been enjoying cuddling under it on the chilly days this last week. 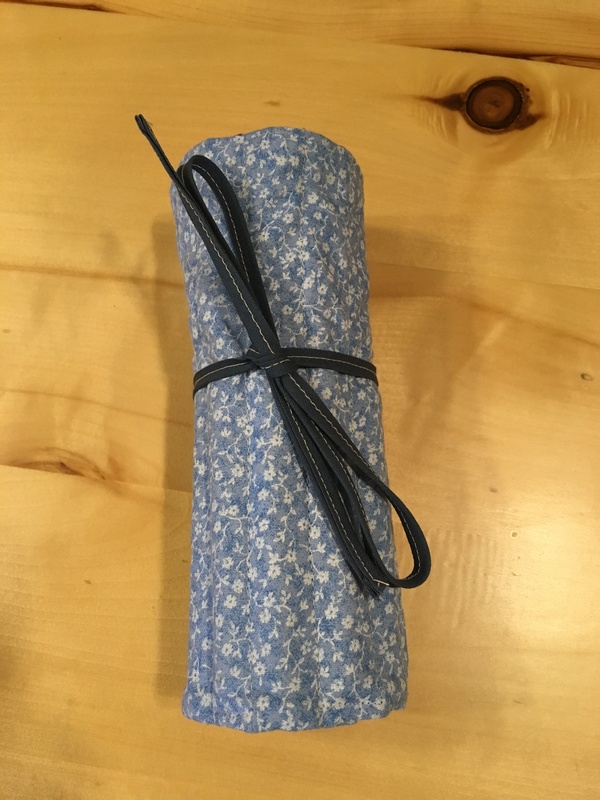 It was a fun use of scraps. I still have a lot of scraps left and I am considering starting a different scrap afghan to use them up. The yarn is Greenwood Fiberworks Cashmere Delight and it is oh-so-soft and lovely to work with and have moving through my hands. The second is the Let Go cardigan. 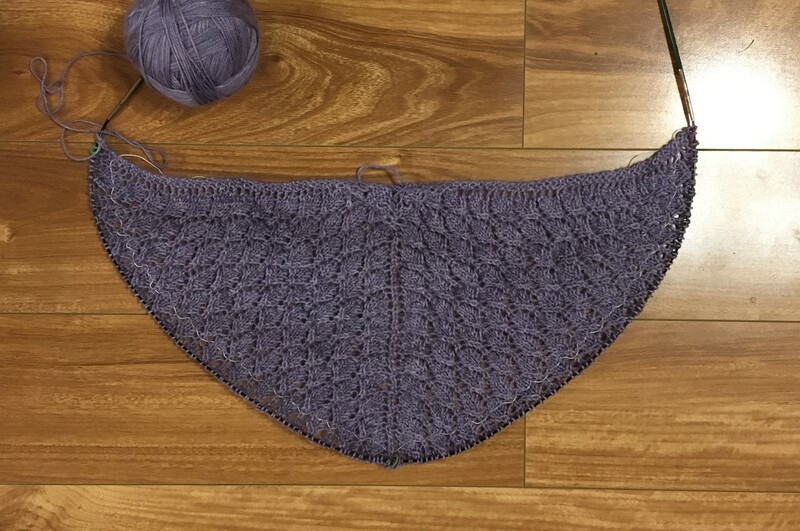 This is my second time using this pattern and I am doing it with a very different yarn than last time. I am using KnitPicks Gloss DK yarn and it is also very soft and fun to work with. I am really enjoying being back into knitting again.